Duke Bakery customers retention program. Yay or Nay? Duke Bakery offered an “attractive promotion” to all foreign students at $1 off for each bread purchased when they flash their student pass. Netizen – Gary Chua felt “truly disgusted” and did an online rant which generated over 300 shares. It is just a case of xenophobia. They feel that privileges should be given to locals or everyone but not exclusively to foreigners. There’s so much self entitlement in this “rant”. 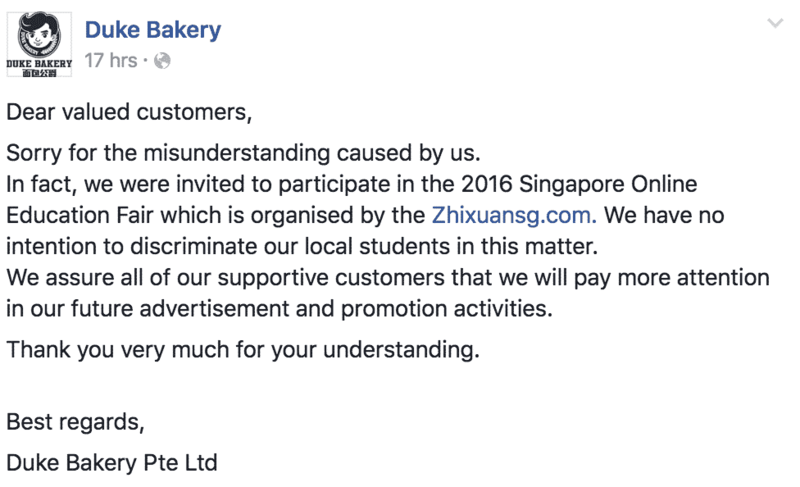 The business belongs to Duke Bakery and they have the right to create any promotion they wish. There can be so many possibilities on why this campaign was created. It could be a case that the international schools approached them, or even a case where they have other promos in the pipeline for AB testing. Who knows? As much as it might offend some other overly sensitive gender group out there, they can jolly well give discounts to every man even if it is not Father’s Day simply because they wish to attract the male demographic to start buying bread. This is their business, and they do not need to explain to people their rational behind their campaign. They can do anything they want as long as it is not against the law. Even if it has to do with your bra size. But guess what? it is not quite possible in Singapore because everyone is overly sensitive over the smallest thing. With that in mind, I think businesses should really be more careful when it comes to crafting such campaign before getting themselves “featured online”. Unless of course, your mantra is “bad publicity is still publicity”. There we have it. Don’t judge too quickly people.